Steven Muller, a major figure in U.S. higher education who served 18 years as president of The Johns Hopkins University, died Jan. 19 at his home in Washington, D.C., of respiratory failure. He was 85. A visionary leader, Muller headed the Baltimore-based university from February 1972 to June 1990, the second-longest tenure of any Johns Hopkins president, and also served for about a decade as the president of The Johns Hopkins Hospital. In a message to the Johns Hopkins community, current university President Ronald J. Daniels praised Muller’s innovation and foresight, which dramatically enhanced the institution’s national and global prominence. “The university where we teach, learn, work and engage in scholarly endeavors simply would not exist in its current form had it not been for Steve Muller,” Daniels said. President Emeritus Muller joined Johns Hopkins as provost in 1971. He served in that position for just 10 months before the board of trustees selected him in 1972 to lead the university. He was the institution’s 10th president. That same year, he was tapped to head the hospital, making him the first since Daniel Coit Gilman, the university’s first president, to hold both offices. Muller relinquished the hospital post in 1983, continuing on as president of the university. He created the affiliation with the Peabody Institute that led to that once financially troubled independent institution eventually becoming a strong and vital division of the university. His commitment to the arts and culture also resulted in the restoration and reopening of what are now Homewood Museum and the Evergreen Museum and Library. Muller was instrumental in bringing the Space Telescope Science Institute to Baltimore and the Homewood campus, ensuring that science operations for the Hubble Space Telescope would be controlled there and creating enormous collaborative opportunities for the university’s own physics and astronomy faculty. That faculty now includes two Nobel Prize winners, Adam Riess and Riccardo Giacconi, who won the physics prize in 2011 and 2002 respectively. The institute’s building, which now bears Muller’s name, stands across the street from the university’s Bloomberg Center for Physics and Astronomy, also built during Muller’s presidency. President Muller, with prescient insight into China’s future as a global power, ensured that Johns Hopkins would be an instrumental part of the conversation between that nation and the United States, establishing the Johns Hopkins-Nanjing University Center for Chinese and American Studies in 1986. On Muller’s watch, the university also established the Krieger Mind-Brain Institute and academic centers for part-time students in Baltimore, in Montgomery County, Md., and at the Applied Physics Laboratory. His foresight also led to the reestablishment — as a standalone division of the university for the first time — of the School of Nursing, acknowledged just a few decades later as one of the nation’s best. He also reestablished the Whiting School of Engineering as a separate division after it had been merged with the School of Arts and Sciences. Muller also was a leader in the expansion and modernization of what is now the Johns Hopkins Bayview Medical Center campus following Johns Hopkins’ acquisition of the old City Hospitals from Baltimore City. A skilled fundraiser, Muller financed much of the university’s growth with dollars raised in two highly successful campaigns: the Hopkins Hundreds Campaign, which raised more than $109 million for the university and hospital between 1973 and 1976; and the Campaign for Johns Hopkins later in his tenure, which brought in more than $600 million, well exceeding its $450 million goal. A man of both substance and style, Muller is credited with moving the university into a new era while preserving its tradition of leadership among research institutions. A passionate advocate of the humanities, Muller was a specialist in comparative government and international relations. His many writings include a textbook on these subjects and numerous professional articles. He will forever be remembered for musing that “nobody ever died of English” while arguing very seriously for the need to support the humanities as vigorously as medicine and the life sciences. In 1983, Muller established the American Institute for Contemporary German Studies, fostering meaningful relationships between the United States and his native Germany, which he and his family fled in 1939. In recognition of his contributions to German-American relations, Muller was awarded the Commander’s Cross of the Order of Merit by the president of the Federal Republic of Germany in 1980. In 1988, he was also named Commendatore by the president of Italy. Muller came to Johns Hopkins from Cornell University, where he was vice president for public affairs and before that director of the Cornell University Center for International Studies. He had also held a tenured appointment as associate professor of government. He served in the U.S. Army Signal Corps from 1954 to 1955. From 1956 to 1958, he was an assistant professor of political science at Haverford College and then returned to Cornell, his graduate school, as assistant professor of government. Muller was born in Hamburg, Germany, in 1927. When he was 10, his father, Werner Muller, a lawyer who had earned an Iron Cross in World War I, was incarcerated on Nov. 9, 1938, Kristallnacht, or Night of the Broken Glass, when Nazis conducted coordinated attacks against Jews throughout Germany. Months later, Werner Muller was released from prison, presumably on the orders of Hermann Göring, founder of the Gestapo, who had also served in World War I and felt that those who had fought for Germany in that conflict should be freed. The Muller family fled Germany in 1939, first to London, and then, in 1940, to the United States. On the advice of doctors because Muller’s father had asthma, the family settled in Los Angeles. Muller attended Hollywood High and earned money selling The Saturday Evening Post and other magazines. He was “discovered” by a film script writer outside Schwab’s Drugstore and subsequently had roles in seven feature films alongside such actors as Ingrid Bergman, Roddy McDowall and Irene Dunne. But education overtook acting and he enrolled at the University of California, Los Angeles, graduating in 1948. In 1954, Muller earned a degree in politics from Oxford University, where he was a Rhodes Scholar. He earned his Ph.D. at Cornell. In retirement, Muller chaired the board of St. Mary’s College of Maryland and played a key role in transforming the school into Maryland’s public honors college. He was honored by the college in January 2004 with the Order of the Ark and the Dove. 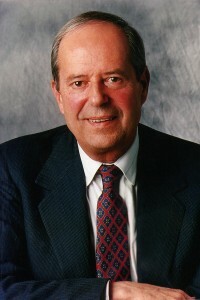 Muller served on numerous corporate and non-profit boards. He was a director of Alex. Brown, Beneficial Corp., CSX, Millipore, Safeway and Van Kampen Funds, and he served as chairman of the board of directors of the Federal Reserve Bank of Richmond. He was also a director of the Atlantic Council, a member of the International Biomedical Research Alliance, and a fellow of the American Academy of Arts and Sciences. In addition, Muller was a member of the American Association of Rhodes Scholars, the Council on Foreign Relations, and the International Institute for Strategic Studies. He served twice as a director of the German Marshall Fund of the United States. Muller also served as a member of the Presidential Commission on White House Fellowships and the Presidential Commission on World Hunger. Muller is survived by his wife of nearly 13 years, Jill E. McGovern; two daughters, Julie M. Mitchell of San Francisco and Elizabeth M. Casparian of Princeton, N.J.; five grandchildren; and a brother, Norbert Muller of Edwards, Mo. His previous wife of 48 years, Margie Hellman Muller, died in 1999. More information about Muller is available here. Family visitation will be Wednesday and Thursday, Jan. 23 and 24, at 2315 Bancroft Place NW, Washington, D.C. 20008. Arrangements for a memorial service at Johns Hopkins will be announced later.